MAE SAI, Thailand — Rising waters prevented divers from moving deeper into a cave complex in northern Thailand flooded by heavy rains, forcing them to suspend their search Monday for 12 boys and their soccer coach who have been missing for two days, but officials said they believe they're still alive. 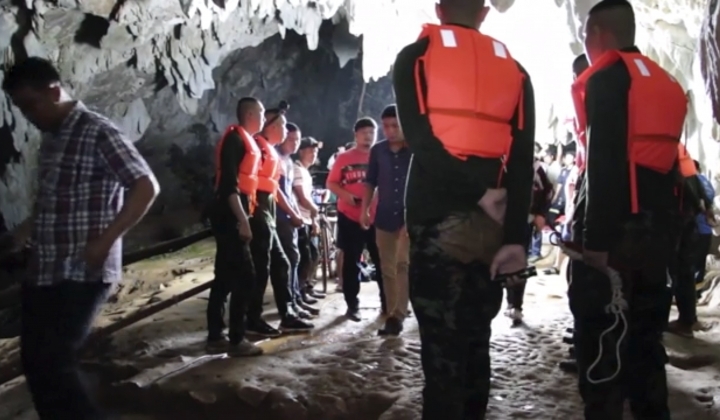 The rising water frustrated efforts by the rescuers, including navy SEAL divers, to search farther in the cave, which is thought to be about 6-8 kilometers (4-5 miles) long and contain some large chambers. By Monday evening, officials made the call to temporarily pull out. "We went in a few kilometers and were able to enter a second chamber behind the entrance. In that chamber, there was an area where I saw shoes and bags left behind on the ground. We believe the students have gone further in," said Lt. Naponwath Homsai, a SEAL team member. 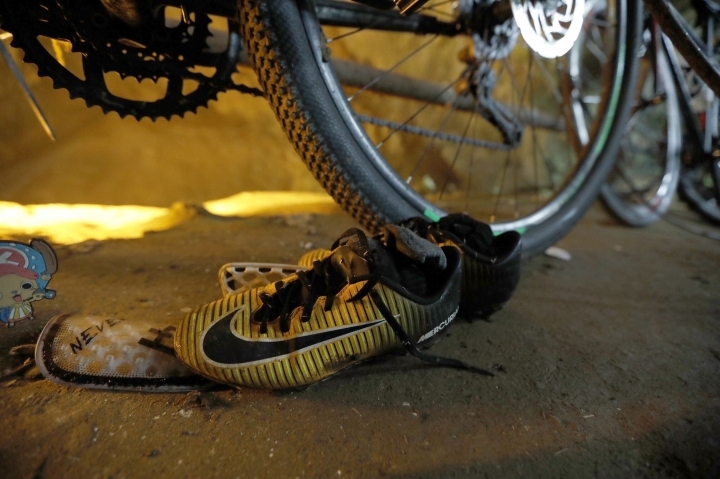 Bicycles, backpacks and soccer cleats the boys left behind remained at the entrance of the cave. The area was filled with soldiers and rescue personnel. 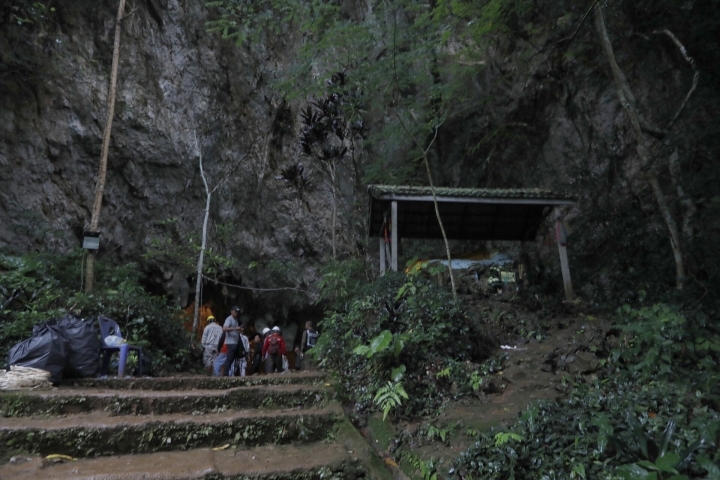 Mothers and other relatives of the missing boys held a prayer session Monday evening at the entrance to the cave, where there is a shrine with a statue of the Buddha. They laid flowers and then some walked inside, where their cries could be heard echoing off the walls. "My son, come on out! I am waiting for you here!" one woman cried. Another kneeled down near the bicycles and prayed, asking "Where is my child?" 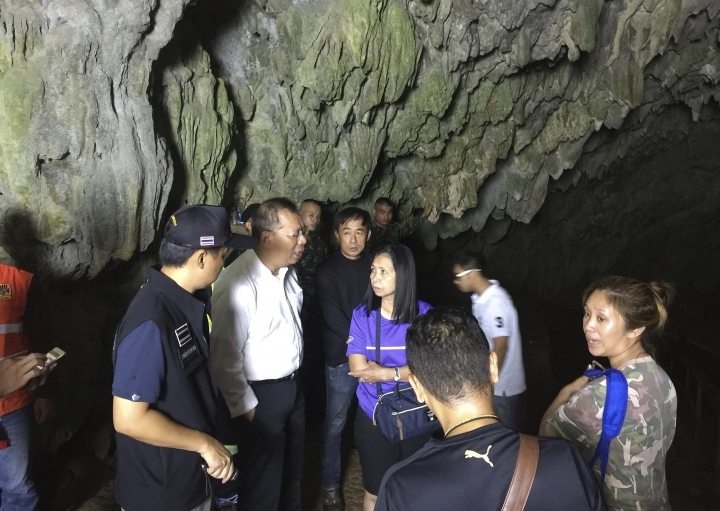 Despite heavy rain and rising waters, officials are hopeful that there are still safe spaces in the cave complex, Chiang Rai Deputy Governor Passakorn Bunyalak told a news conference Thursday afternoon. 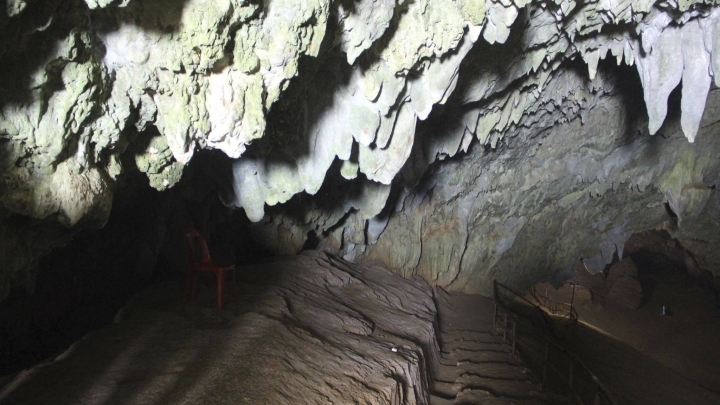 Officials said parts of the cave were flooded under at least 5 meters (16 feet) of water. 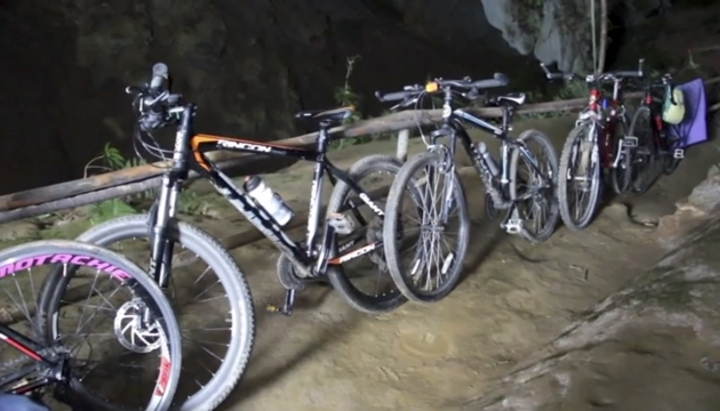 Kamolchai Kotcha, an official at the forest park where the cave is located, said Monday morning that attempts to reach a large chamber about 4 kilometers (2.5 miles) from the entrance of the cave had failed as the passage is extremely small, "flooded and covered with sand and mud." 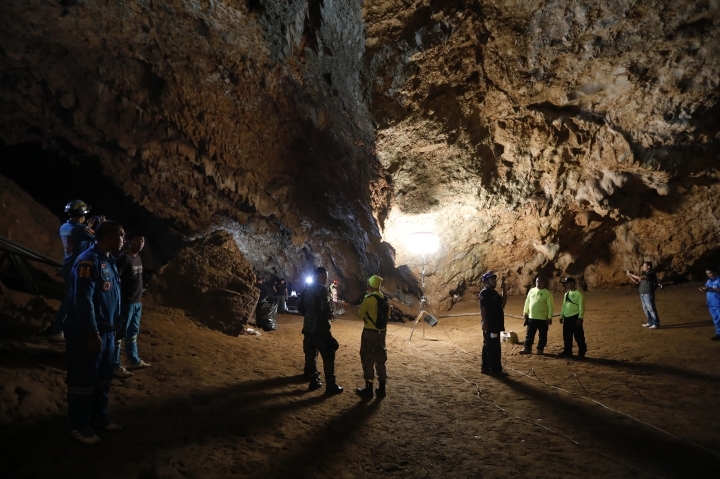 In "The Caves of Northern Thailand," an online guidebook last updated this year, the cave is described as explorable only from November to June due to flooding. It says the cave has an "impressive entrance chamber" that is about 80 meters (260 feet) long and leads to an easy walk along "spacious passageways" that last for about a kilometer (half a mile). "At the end of the marked path the passage enters a series of chambers, boulder collapses and boulder chokes where route finding can be difficult," it says. After a few hundred meters (yards), the cave narrows to a passage 2 meters (6.5 feet) wide and 3 meters (10 feet) high, it says. After that area, the cave splits off into different directions, including several that lead to other chambers, pools of water or places with high "avens," shafts that reach the surface. 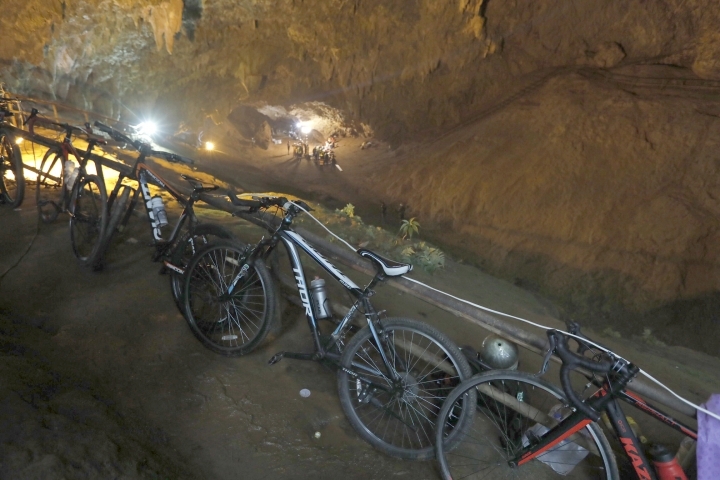 Anukoon Sorn-ek, a geographer and expert on the Tham Luang Nang Non cave, said divers have made it about 3 kilometers (1.8 miles) into the complex. He said the cave maintains a relatively stable temperature of about 25 degrees Celsius (77 degrees Fahrenheit). "But they have to be found first," he said.